Jim has dedicated his life to bringing new plants to market. Though he’s at the age where most of his peers are peacefully retired, he can still spot a new tree while going 75 mph down the highway. Jim is a partner of UpShoot and co-owns the company with his daughter, Maria. Before founding UpShoot, Jim was the CEO of Lake County Nursery, Inc. in Perry, Ohio. As CEO, he oversaw a staff of more than 250 people and led the nursery’s related businesses—South Ridge Trucking, New Plants Inc., Champion Garden Towne and a residential and commercial landscaping firm. Beyond the nursery, Jim’s legacy lies in new plants. Jim has bred, selected and introduced more than 200 patented and trademark plants to the industry. UpShoot continues to license, market and sell these varieties. 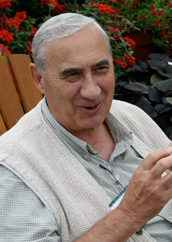 Jim has served in a number of horticultural and community organizations. He is a member of the Ohio Nursery and Landscape Association, AmericanHort, National Association of Plant Patent Owners and a member and past president of the Nursery Growers of Lake County, Ohio. In the past, he has served on the Lake Metroparks Board of Park Commissioners, the board of the American Heart Association and is the Director Emeriti for Lake Erie College. For more information about Jim, click here.